Here's an in-depth look at new shows airing on Tuesday nights this fall. Come to ABC's The Muppets expecting a spiffy new version of The Muppet Show and you may be disappointed, possibly even turned off, by the bitter edge underlying these funky, fuzzy immortals. "My life is a bacon-wrapped hell on Earth," moans Kermit after weathering the latest tantrum from Miss Piggy, his ex-girlfriend and star of the late-night show he's producing. Jim Henson's creations have always worked on multiple levels: appealing to kids because they're comical puppets with vivid personalities, yet also endearing to grown-ups, like the best of Charles Schultz's Peanuts, because of the wry humanity they exhibit while sending up pop-culture and show-biz clichés with a satirist's eye. The Muppets takes it a step further, and some may feel a step too far, by showing these characters in seemingly unguarded moments, often at their worst, as an unseen camera crew goes behind the scenes of the fictitious Up Late With Miss Piggy in mock-documentary The Office/Modern Family style. This takes some getting used to, and maybe even longer to warm up to. Still, it's often very funny. I laugh at almost anything involving the haplessly self-sabotaging warm-up comic Fozzie Bear: whether he's desperately trying, and failing, to impress his human girlfriend's parents, or ingratiating himself with Jay Leno (makes sense he would be Fozzie's hero). But the laughter curdles a bit when the writers push the innuendo, as in this Fozzie monologue-while-driving: "When your online profile says, 'Passionate Bear Looking for Love,' you get a lot of wrong responses. Not wrong (he backpedals), just wrong for me." Try explaining that to your kid. Or to your parents, depending. And yet, I chuckled. It's a Fozzie thing. Because The Muppets adopts the single-camera, no-laugh-track approach favored by nearly every network but CBS (which is going the single-camera route as well in its new fall sitcoms), when a gag falls flat in this backstage burlesque, you really feel the dead air. Thankfully, The Muppets moves at a fairly fast clip, with plenty of rough-and-tumble slapstick for the youngsters and an overall tongue-in-fist sensibility that should tickle most willing adults. This is especially true in next week's second episode, when Miss Piggy falls for a Svengali-like (and very game) Josh Groban, whose ideas to "improve" her show include taking the Electric Mayhem band acoustic and booking intellectual authors like Zealot's Reza Aslan. "You write so eloquently about history," Miss Piggy gushes. "Where do you get your ideas?" 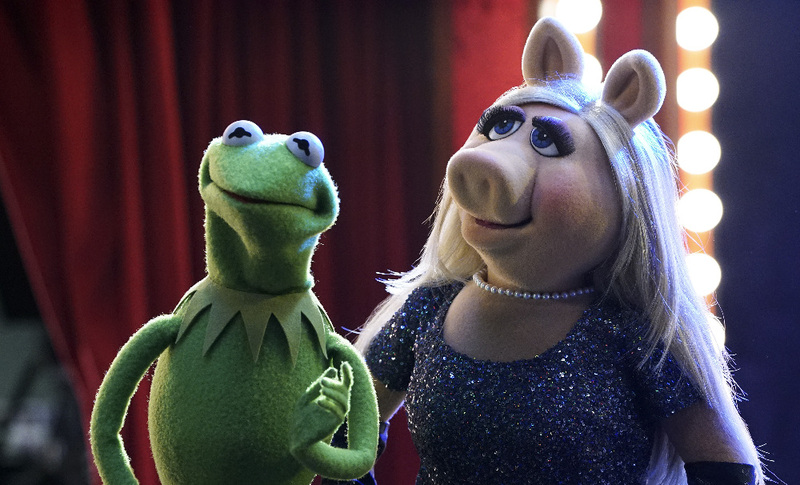 With celebs like Groban, Elizabeth Banks and Imagine Dragons winningly playing along (and inevitable ABC cross-promotional appearances by the likes of Tom Bergeron and black-ish's Laurence Fishburne), I keep wishing The Muppets would spend more time on Miss Piggy's show-within-the-show than on the behind-the-scenes shenanigans, where Muppets tend to treat other Muppets badly. Some innocence has been lost in this rollicking new version, and I wonder if we won't soon hear Kermit singing, "It's not easy being mean." I love horror, but generally can't abide Ryan Murphy's increasingly witless American Horror Story franchise. (And yes, I'm sucker enough to want to check into next month's Hotel, primarily for Lady Gaga.) I'm also a big fan of most of the meta Scream movies (not so much MTV's inept series version), and not surprisingly, Murphy's Scream Queens leaves me even colder, spoofing the slasher-thriller genre with a sledgehammer delivery of trashy schlock. It's almost certain to be a hit, which might be depressing if it all weren't so bloody negligible. More of an occasion to cringe than scream, Queens is a mean-spirited and imbecilic cartoon about murders in a Sorority House From Hell, and plays as if it were concocted by 14-year-olds sifting through their ugliest tweets. Emma Roberts (whose brittle appeal escapes me) stars as ringleader Chanel, who in one of many Heathers rip-offs insists her sycophantic underlings call themselves Chanel #2, Chanel #3 and so on. If it strikes you as even remotely funny that Chanel #1 would call her portly housekeeper "White Mammy," you will bust a literal gut as the Chanels mock the deaf, the homely, the overweight, as we impatiently wait for these glittery dimwits to get their gory comeuppance. It can't come quickly enough. There is exactly one effective scene in the seemingly endless and ghoulishly vulgar two-hour opener, in which a victim texts till the last breath. (A version of this can also be seen on MTV's Scream, which lacks Queens' marquee cast appeal but is just as idiotically plotted.) And there is exactly one good reason to watch this show: original scream queen Jamie Lee Curtis (Halloween, etc.) as the college's Dean Munsch—ugh, you can imagine the puns; remember Glee's Coach Beiste? Throwing pithy shade at these pathetic junior divas, Curtis alone slays us. She wants them dead almost as much as I do. Turns out there are limits when it comes to adapting movies into TV—and the feeble sequel to 2011's Limitless is especially off-putting, asking us to root for a slacker schmo (a wan Jake McDorman of last season's insta-flop Manhattan Love Story) who suddenly becomes a instant genius with super-strength and mad skills like lock-picking, all because he has access to the magic brain-expanding pill called NZT. Worked for Bradley Cooper, after all, who's one of the show's executive producers and makes a too-brief cameo as the movie's politically ambitious Eddie Mora. He promises Brian, our hero, "You're on the verge of having a life that most people can't even begin to imagine." A more telling line is when another character observes, "You're not smart, you're high." Even if NZT helps Brian diagnose what's ailing his sick father (Ron Rifkin, a welcome presence), and solve crimes for the FBI—where he works alongside generic characters colorlessly played by Dexter's Jennifer Carpenter, Hill Harper and Mary Elizabeth Mastrantonio—the unpleasant side effects of this medication include dumbing down a time period that once featured Person of Interest. If Limitless suffers the same fate as CBS's similarly themed Intelligence (which even Josh Holloway couldn't breathe life into), maybe we'll get that underrated show back on the air sooner than later. In which case my enthusiasm would be limitless. Just being live isn't enough. You have to be alive to make a first impression, which is where NBC failed in its laborious experiment in reviving the corpse of the prime-time variety-comedy format with Neil Patrick Harris as a frenetic host. While not achieving the same magnitude of disaster as Ryan Seacrest's Million Second Quiz debacle of two Septembers ago, Best Time Ever With Neil Patrick Harris felt even more instantly forgettable in its premiere last week. The frantic patchwork of stunts and pranks worked up a froth of flop sweat in its attempt to force cheer on the audience. Whether revealing to newlyweds that Neil had photo-bombed their wedding or playing a game with families watching from home, the show's lack of spontaneity was as disappointing as the plug for The Voice (with Neil going undercover) was annoying. There really wasn't much variety to speak of in Best Time Ever after all, and precious little entertainment value. Maybe it will improve, but who'll be watching now that everything else is on?